If you see any of these signs of foundation failure in your home or business, the experts at Foundation Repair Services have the products and experience to get your foundation back to its original level and make it structurally sound again. 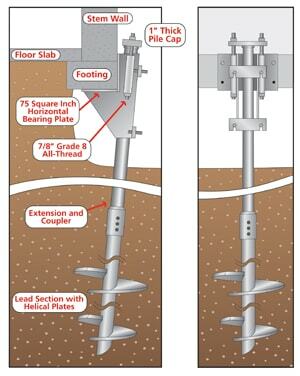 We use underpinning products such as steel push piers and helical piers to level your foundation. These piers are driven deep into the soil through the unstable soil layer until they reach a solid soil layer. After the piers reach the solid soil layer, the entire weight of the structure is lifted onto the piers using hydraulic jacks. The foundation will be back to its original level and structurally sound again. For bowing or leaning walls, Foundation Repair Services uses helical tiebacks to pull the walls back to their original level. They are installed through a small hole that is drilled through the wall, then with exterior excavation, the wall is pulled back to its original level. This will also give the wall strength so that it will not experience any future problems. Don't let a wet basement cause you to lose living space or ruin personal possessions in your Oklahoma home. A wet basement can also promote the growth of mold and mildew. Mold and mildew can cause several health issues for you can your family. Due to the severe storms that can hit Oklahoma, your home is vulnerable to water problems. It is important to have proper waterproofing for your Oklahoma home. Interior waterproofing is done using a sealed drain tile which is installed next to the interior footing, below the concrete floor. This drain tile can be used with a wall vapor barrier. 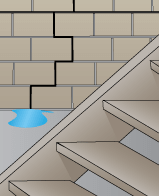 Exterior waterproofing stops water from collecting around your foundation, preventing it from entering the basement. A perforated pipe is installed along the exterior of the foundation and attached to a sump pump system which draws the water away from the foundation. Foundation Repair Services also offers crawlspace encapsulation. We use ECP vapor barriers to line the crawlspace to keep moisture out. Crawlspace encapsulation will keep your crawlspace free of moisture, odor, mold, mildew, insects and structure rot. If you are in need of foundation repair, basement waterproofing or concrete leveling, let the experts at Foundation Repair Services offer you the best solutions for your repair needs. Foundation Repair Services uses only the best products for Oklahoma's local experts in foundation repair and waterproofing. They are manufactured by Earth Contact Products (ECP), the leader in the industry today. We have the experience and use only the best products. We take pride in the outstanding reputation that we have established. Contact us today!